Scotland great Scott Hastings has branded fans who directed verbal and physical abuse at England rugby coach Eddie Jones as “scum of the earth” who should be named and shamed. Ex-Wallaby mentor Jones revealed on Wednesday he feared for his safety while catching a train from Edinburgh to Manchester on the morning after England’s Calcutta Cup defeat at Murrayfield. The Australian travelled alone via standard class to be a guest of Sir Alex Ferguson at Old Trafford on Sunday afternoon, before receiving similar treatment at the hands of football fans on the final leg of his journey from Manchester to London. Video footage shot in Manchester and obtained by the BBC’s Dan Roan shows Jones posing for selfies with Scotland supporters, who then turn on him. One calls him a “baldy ****” as he is ushered into a car. Following a separate incident, British Transport Police are investigating a report of verbal abuse against Jones after officers were sent to meet his train as it arrived into London Euston on Sunday evening. Speaking on Wednesday, Jones cited comments made by Hastings’ brother, Gavin, who said in the build-up to the game that “you just want to rub (Jones’) face in the dirt” as a possible reason behind the abuse. “I’m not aware of what Gavin said, but these gentlemen, if you can even call them gentlemen, they should be named and shamed,” Scott Hastings added. 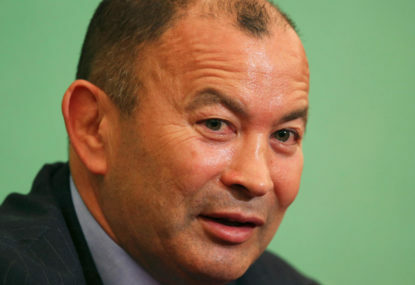 “It is very unfair on Eddie Jones. He had a few boos after the game but I understand when they went to the after-match function they were very magnanimous and respectful. Unfortunately there are some unruly people who are scum of the earth. Scottish Rugby offered strong condemnation upon seeing the footage which has been widely circulated on social media, while former British and Irish Lion John Beattie has apologised to Jones, tweeting “so sorry”. “The disgusting behaviour of those involved does not represent the values of our sport or its fans. Jones has resolved not to use public transport again following the experience and is frustrated given his willingness to engage with supporters. “I’m a human being. I don’t consider myself any different from anyone else, so for me to travel on public transport I thought was OK. But I’ll make sure I won’t in future. It’s as simple as that,” Jones said on Wednesday.